Is Your Metal Fence Ready for Snow and Cold? We don’t know if you’ve noticed the recent cold snap, but we sure have. The official beginning of winter is less than two weeks away and the chill in the air is certainly letting us know! The cold weather and snow that is headed our way could wreak havoc on your Northern Virginia steel or aluminum fence if you haven’t taken the time to winterize it. With the holidays coming up, now is the best time to winterize your fence – before your relatives start taking over your home and all you can think about is holding on to your sanity. The following tips will help you get started with winterizing your aluminum or steel fence this winter! Aluminum – Most times, aluminum fencing won’t require a lot of maintenance. It’s one of the biggest perks of owning aluminum fences. They’re easy to take care of and can survive most weather conditions. One thing that you do need to look out for is the coating. If it has started to wear, moisture and cold weather can cause it to start rusting. Make sure that you either do another coat yourself, or have a professional come in to ensure that your fence can survive a Norfolk winter. Steel – If your fence is already starting to rust, it’s time to repaint to avoid making it worse this winter. A stiff metal brush can be used to remove any rust on your fence. Wash the fence, let it dry, and then apply a coat of primer before repainting your fence. Taking care of your fence before the cold and snow set in will help you avoid bigger problems when spring comes back around. Both – Whether you have a metal fence, a wooden fence, or a vinyl fence, you need to make sure that the latch is ready for the winter months ahead. This hardware is the only part of a fence that regularly moves, which mean the wear and tear can be much worse. Waterproof your latch if it’s still in the preventive maintenance phase. If your latch is starting to rust at all, replace it for security and safety. Your fence is only useful if it’s well maintained. Over the past 50 years, Hercules Fence has developed a strong reputation for professional service and quality wood metal installation. We are here to answer any questions you may have and help you choose the best fence for your wants, needs, and, sometimes most importantly, your budget. Perhaps best of all, we are the largest fence company based in Northern Virginia, affording us the luxury of purchasing the fence you want at a price you will love. That’s what we like to call a win-win! 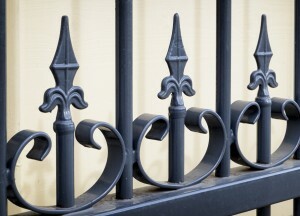 Interested in a New Metal Fence? Please contact Hercules Fence of Manassas, Virginia by calling (703) 551-2609 or visiting our website. You can also follow Hercules Fence on Facebook, Twitter, Google+ and YouTube! This entry was posted on Friday, December 12th, 2014 at 4:44 pm. Both comments and pings are currently closed.